Beach Villas is situated oceanfront in the quiet neighborhood of North Myrtle Beach. If you are looking for a serene place to unwind with incredible ocean views, look no further. Beach Villa E has a unique "beach house" feel with 2 levels, 3 bedrooms, full kitchen, and private oceanfront deck. A bright, colorful interior lets in plenty of natural light, while big panoramic windows put a spotlight on the ocean view. The master bedroom features a king bed, wall-to-wall windows, flat screen TV, and an updated private bath. The upstairs guest bedroom has a private bath, flat screen TV, and writing desk perfect for your laptop. The downstairs bedroom has bunk beds and flat screen TV, with a bathroom just outside the door. The kitchen is equipped with everything you need to cook and serve, with updated stainless steel appliances and quality cabinets. Relax in the living room on the plush furniture or enjoy a movie on the giant wall-mounted flat screen TV. Just outside the living room, you'll find the balcony, where you can take in the peaceful sunrise or have happy hour with your group. 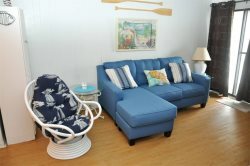 Beach Villa E is pet-friendly too so the family dog is welcome to enjoy a beach vacation with you!! Beach Villa E is on the northern side of Cherry Grove, away from the crowded resorts and attractions. However, activities and restaurants are just a short drive away. Book your vacation in this special property now!